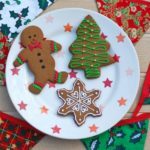 This gingerbread recipe couldn’t be simpler, and is perfect for making festive cookies to decorate the tree or to give as gifts to friends. It’s also great for all those school Christmas fairs that are coming up. Last week I recieved a gorgeous gift of candy cane rocky road from the fabulous Katie of Feeding Boys and a Firefighter, as part of the Waitrose #bakeitforward campaign. To continue sharing the baking love, I made these cookies for my lovely friend Jane and her boys. Jane lives over the road from me and hers is always the first door that I knock on when I have run out of eggs, washing up liquid or any number of emergency supplies. She is also a very talented lady, and has a fantastic sewing blog that is well worth a look. You will find her at Handmade Jane. Preheat oven to 180°C/160°C fan. Use a large cookie cutter to cut your chosen shapes. Place the cookies on a lined baking tray and bake for approximately 12 minutes, or until the edges are just starting to darken. 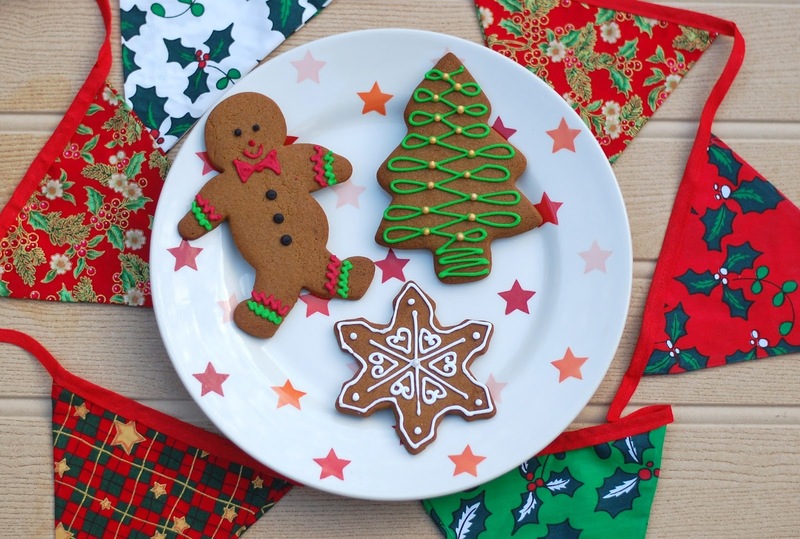 When the cookies are cool, decorate with royal icing.